Rotary vs Foil Shavers - What is the difference between Them? 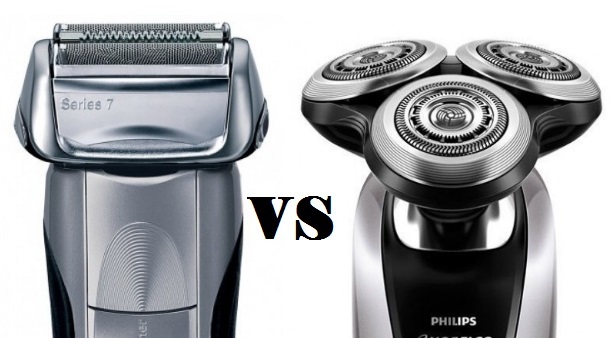 Rotary vs Foil Shaver: What is the difference between a Foil and a Rotary shaver? Shaving is a normal part of our lives, whether we like it or not, we spend a considerable amount of time shaving. For some, shaving isn’t the most desirable thing, but to maintain that clean smooth appearance, and toned face, it’s something we reluctantly do. When it comes to shaving; most folks prefer electric shavers, and rightly so – they give a quick shave when necessary, they are easy to use and clean, and more impressively, they are extremely versatile in their use. Whatever your shaving needs are, there’s an electric shaver that will get the job done. But choosing the right electric shaver is easier said than done, especially if you take into consideration the level of investment you could be making, so to avoid buyers’ remorse – it’s important to make the right choice. However, when deciding on which electric shaver to choose; it generally boils down to two options: foil or rotary. Electric shavers are certainly the way to go. So why not forget about those sets of cartridges that only last for a few weeks then gets thrown out? If you agree, in this article, we will look at what makes the rotary and foil electric shaver to stand out from the crowd, and then we will leave you to decide on which electric shaver to choose. As previously mentioned, the foil and rotary electric shavers are undoubtedly the best two options currently available on the market. It’s not a question of if either of these shavers is worth your investment, for starters; they last on average about 20 years. So, the real question is; how do these shavers match up against each other? And what are the benefits of using one over the other? After all, they are both electric, which means a closer shave, wet and dry. What is a Foil Electric Shaver? A foil electric shaver contains oscillating blades (the blades moves from left to right) in a neat looking compact head. The blades, commonly called cutters are delicately placed beneath a thin metal-like foil covered with perforations. The foil serves as a guard to protect one’s skin from the blades, and it also draws the hair from one’s skin toward the oscillating blades to be cut. What is a Rotary Electric Shaver? The rotary electric shaver has a very interesting design, its built in such a way to allow the shaver to pivot easily over the contours of your face with its circular independent heads while shaving. How do I Choose Between a Rotary and a Foil Shaver? We will keep our promise and let you decide. The bottom line is that both the foil and rotary electric shavers are great options for your shaving needs. However, depending on your hair growth and your skin’s sensitivity there are advantages of using one over the other. So, with that in mind here are a few pointers to consider before you finalize your choice. You have less sensitive skin. You have fast growing hair which you don’t intend to shave daily – the rotary electric shaver works best on longer, thicker, and coarser hair. You have strong facial features – the rotary electric shaver can easily maneuver around a sharp jawline, a jutting chin, a prominent Adam’s apple, or high cheekbones. You have rapid hair growth in generally difficult to shave areas. Taking the above factors into consideration, it’s safe to say that the rotary electric shaver is a perfect choice for men with long and/ or think hair. You have sensitive skin – the foil electric shaver is very easy on the skin. You shave daily – foil shavers work great with fine facial hair. You want a very close and smooth shave. You have fine facial features. You prefer shaving in straight lines. Most electric shavers are both ‘wet’ (you can use it in the shower and with shaving cream) and ‘dry’ (you can use it out of the shower and without shaving cream). Electric shavers with the option to use wet and dry are a god sent, especially if you have extremely sensitive skin and want to use the rotary electric shaver. So, finding a good quality shaving cream should be the next item on your list. Finding a good quality shaving cream isn’t that difficult, just take a close look at the ingredients and see if the shaving cream contains ingredients that act on the hair’s cuticle (the outer layer of the hair). If so, it’s a good indication of a quality shaving cream. A great benefit of using good quality shaving cream is that they cause the hair on your skin to absorb water and swell, which always result in the hair becoming easier to cut, and of course, less chance of causing irritation and/or razor burn. To get the best shave, it’s recommended that you massage the shaving cream into your face and leave it there for a minimum of 5 minutes, doing this allows the cream to soften the hair, making them extremely easy to cut. Generally, using shaving cream will give you the best shave with either rotary or foil electric shaver, a wet shave is quite comfortable and needless to say… a pain-free experience. For most of us, shaving is not always our favorite cup of tea, but if done correctly by using the proper shaving techniques, shaving can become an experience to envy. Shaving the most sensitive areas of your skin, especially before the shaver heats up is advisable when using a foil electric shaver. Unlike with the rotary electric shaver, avoid moving the foil electric shaver in a circular motion. Shave in straight lines, moving against the grain left to right. No need to mention that with rotary electric shaver you move the shaver in a circular motion across your skin. At times we may be in a rush, but don’t forget to wash your face after shaving, you can also add some aftershave lotion. And at all cost avoid alcohol-based aftershaves, they are bad for your skin. Now that you have completed your shaving, it’s equally important to clean your shaver to reduce the occurrence of acne. Follow the manufacturer’s instructions to achieve the best clean.